Well, I just thought that you might like a little information about this web site. Above is a picture of my wife Rebekah and myself (Jim). The most important thing in our lives is our relationship with the Lord Jesus Christ. And I wanted to do something that might in some small way help to fulfill the Great Commission (Matthew 28:19-20). We went on-line on May 20, 1995. 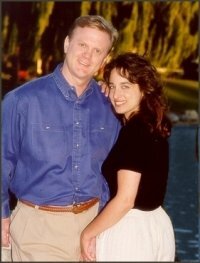 For 25 years, my home church had been Calvary Chapel of Costa Mesa, pastored by Chuck Smith. In 1998, I moved to Calvary Chapel Rancho Santa Margarita to become more involved in the mission work of the church through Safe Harbor International Relief—be sure to see my pictorial journal of our relief mission to South Sudan in 1998. Through these ministries, I have learned so much about the love of the Triune God (the Father, the Son—Jesus Christ, and the Holy Spirit). And have developed a heart for missions. In 2005, we were led to assist in a church plant in Mission Viejo, CA, by the name of Reverence Bible Church. The church is in an area heavily churched by the seeker-friendly movement. At Reverence Bible Church we desire to exalt God, by focusing on Him, the teaching of His Word, and reaching out to the community. The Christian life is one of great satisfaction and hope, but not short of tribulation and pitfalls. JoshuaNet is aimed at helping those who are searching to find the Lord. And for those who already know Him, to provide a seed in your heart to know the Lord better and to foster a real hunger for His Word. The Lord called me to full-time ministry as the Executive Director of Sowing Circle Ministries, the parent ministry of the Blue Letter Bible. If you have never visited the Blue Letter Bible, please take a look. It is a site for those desiring to study the Word of God, and mature in their relationship with Jesus Christ. If you have any comments or suggestions, please email us at servants (AT) joshuanet (DOT) org.